Tim Pascue, 29, a valet parker at a Center City condo, wants to take care of his family, but also donate to CHOP -- the Children's Hospital of Pennsylvania. UPDATE, 11:03 p.m.: The winning numbers in the Powerball lottery jackpot on Saturday night are 32-16-19-57-34, with the Powerball 13. Tom Mackey plans to show up for work Monday if he wins the record-breaking Powerball jackpot, which is nearing its way towards a billion dollars. After all, the Philly resident says he will have to rub it in just a bit to fellow employees at Hahnemann University Hospital. But don't count on finding the 52-year-old at work on Tuesday if he wins the jackpot that is already at $900 million: He'll be retired then. And if Iris Pizarro, 42, wins along with the six workmates she has pooled with on Powerball tickets, the 24/7 Penn Crises Response Center in Center City where they all work could be a bit short staffed next week. "We only play when it gets this big. I don't know what I would do with the money. But most likely not work," she said. 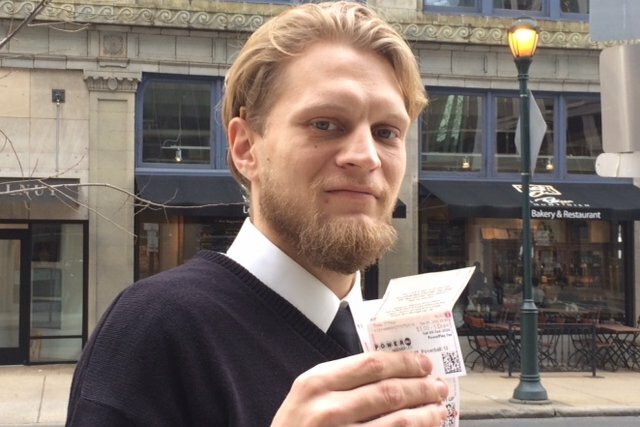 Tim Pascoe, 29, a valet parker at a Center City condo, was a Powerball virgin -- until Saturday. But when the jackpot exceeded $900 million, it was time to put some money in, he decided. Unlike many who let the machine decide, Pascoe picked his own numbers for the drawing Saturday night. He'll be checking for results via his mobile phone, not watching live at 10:59 p.m., and hoping a win means he can provide cash and home for a bout 15 people in his family, as well as making a serious donation to the Children's Hospital of Pennsylvania. Patrick -- who didn't want to give his last name because, well, he doesn't want you bugging him if he wins -- says he's taking a chance because he's semi-retired "and bored to tears." An international consultant, Patrick was philosphical about the need to take a chance -- despite the fact that chances aren't good. But after all, he's won $100 on several tries. "I rarely play. I only play when there is value, when the near certainty of of losing is balanced by the chance of winning eternal financial freedom -- or at least 30 years if my girlfriend is in charge of the spending." Patrick has no concrete plans for spending the big bucks, because he knows winning is so unlikely. "I don't delude myself. But a shortcut to the American Dream and taking a chance with a small investment, just $2, sure." But he says he'd buy a nice home, take care of family and give to charities that fight poverty should fate turn in his favor. "Oh, and I'd take the cash. No annuity." Such is the stuff that dreams are made of. And keep in mind, if there is no match to all the numbers, next Wednesday's jackpot is expected to hit $1.3 billion.